Ok, more cool stuff, but as always the best til last. More sunset images, some with pink, or yellow clouds, but all with a blue sky and yellow sun, (the first probably also has a dust devil). Yep, more Lichen shadows. Very hard to see on the rock, but the shadows are pretty obvious. I don't want to say that there are tree's on Mars, but geesh this sure looks like some. 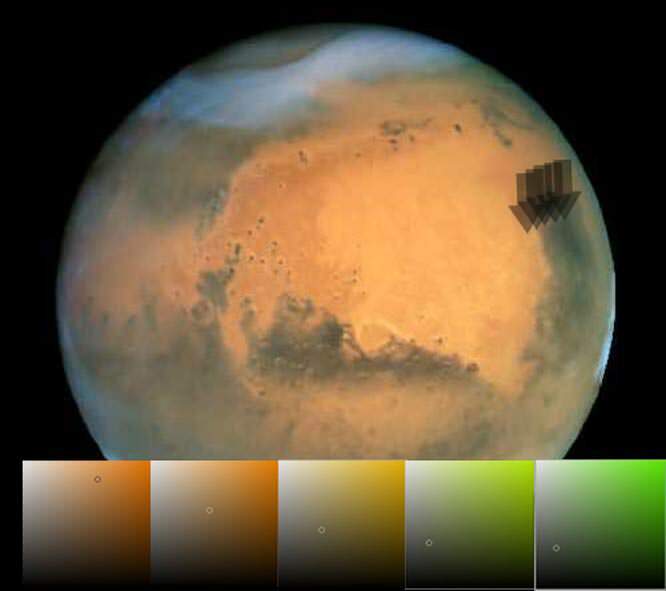 The color picker when l got rid of the red nonsense, didn't show green, but it did show the darker end of red/brown, so if it is martian shrubs they are probably dead. 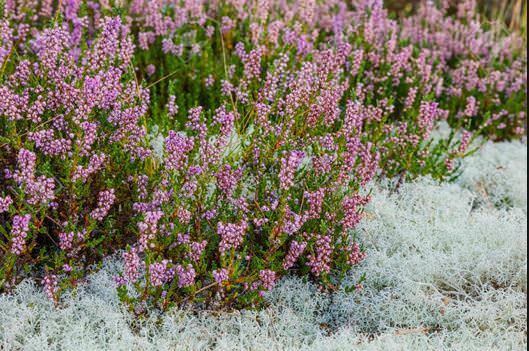 Since Mars has Lichen, then it could have a lot more. 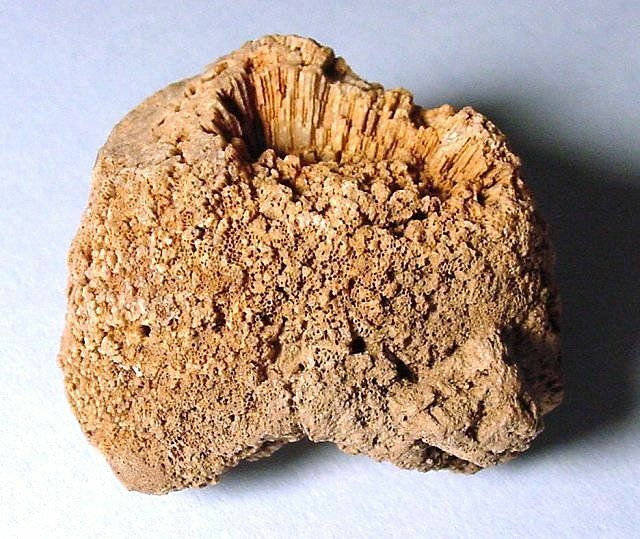 Speaking of Lichen, the Martian stuff may be related to this one? There are so many Earth based ones, it is hard to tell, but this seems to fit previous images of a flowering plant. 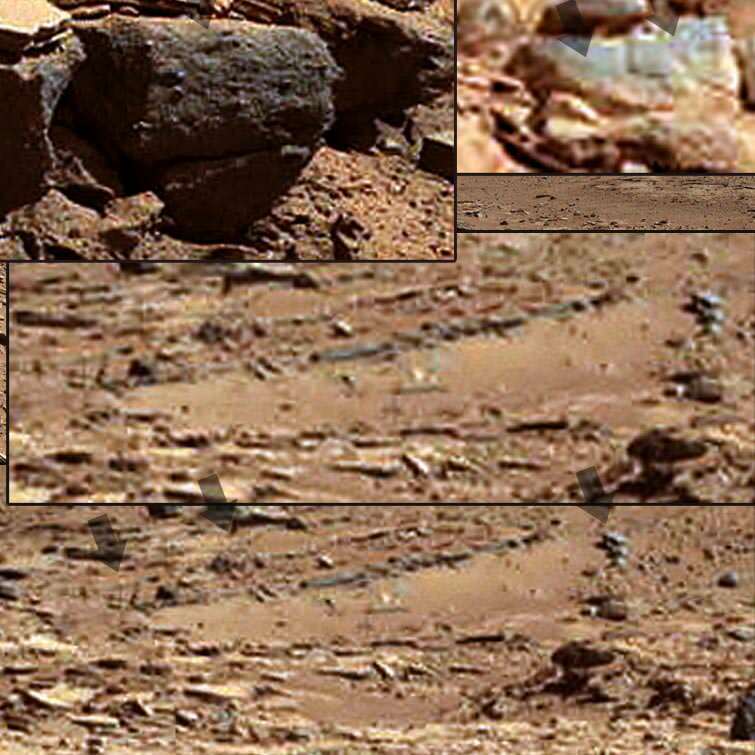 I am more curious in the rocks that look like petrified sponges like the lower left corner of image 1, with that same rock showing up in other locations in the other frames. The second image seems to have at least 3 or 4 more of this petrified sponges. Sponges? 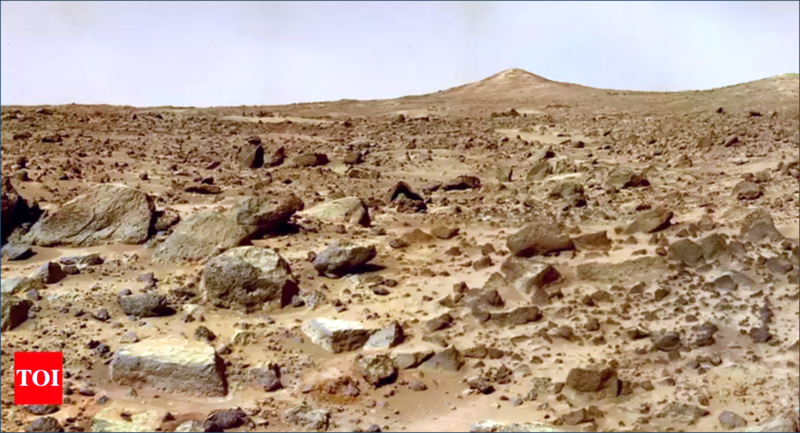 There are plenty of volcanic rocks on Mars, but you may have to point those ones out to me. Ok, l did a quick search for lichen on Mars, and yeah, slam dunk that Mars has plant life. And l ran this through the color picker, with lime green/gray being the dominant color. Ok, SpaceNut, thanks but it wasn't my image, l will try to find the original image today, and show the dissected one here. And thanks for the sponge images, l will keep an eye out. 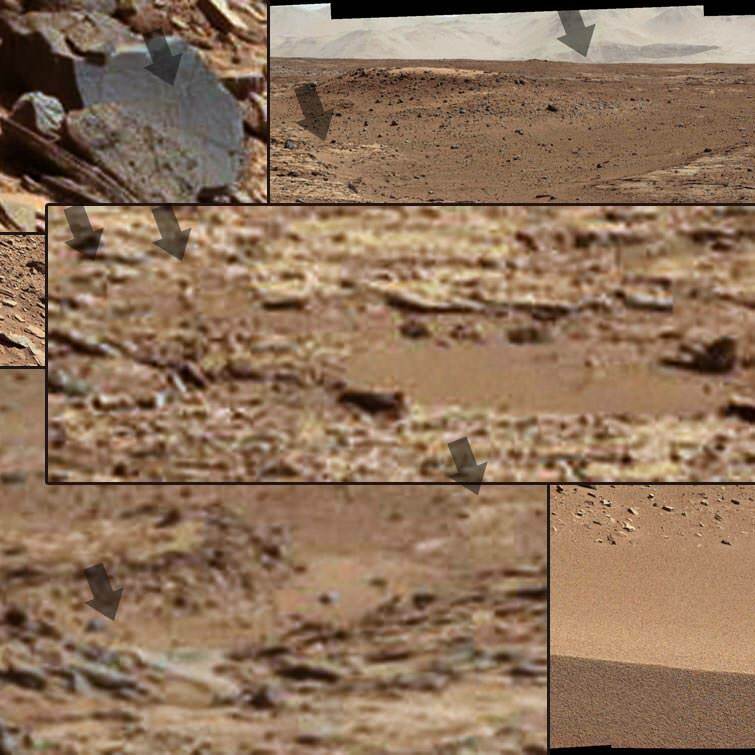 But l agree exciting find to know that Mars does have life on it, but also disturbing that NASA says nothing. I understand why they are releasing it like this, so people that don't suffer from any mental barriers, can see what is really there, and won't be shocked when the big announcement happens, (which is inevitable). The 1957 report that says that mass riots and so forth would ensue if everyone was told about this, still rings in NASA's ears, so about 15 years before full disclosure, we get a trickle, so intelligent individuals can learn the truth and others that are determined not to, will be in for a hell of a shock in the not to distant future. But by then we and others will be relatively informed, hopefully most? And the handful of the rest, hopefully won't go ga -ga enough to cause any serious damage? If you would have asked me 5 years ago, I might have had a more positive mind towards full Disclosure, but we assume so much......that Mars is a planet with no intelligent life and once we on earth, get the the full low down on what's really on the surface and the dread that it may cause . FMP, it's not going to be pretty. 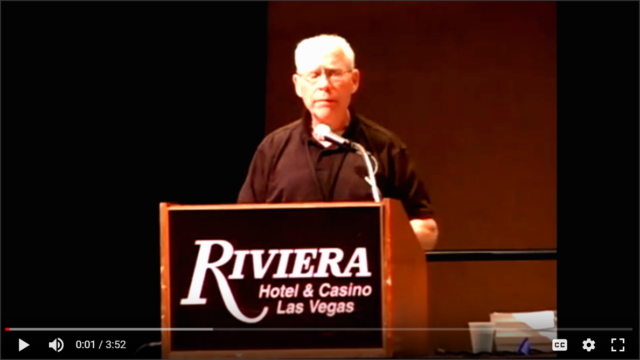 The meeting with Richard Thieme is speaking of, was concerning images of Mars. Nice, yes, it might get ugly and some religious groups may do the mass suicide thing, and others in determined denial may go on a rampage, but since 70% of the US population, (and most likely others) already believe in UFO's, or should, the whole population won't do a nutter. Full disclosure is inevitable, especially with Musk and no doubt others, getting out there, but it will blow the lid on free energy, or cause oil prices to plummet, so NASA will only do it, when oil production is looking iffy. Or they have had their oil, noses in troughs bender, and the party is over, (relief for the poor). Jim Carrey, lol, yeah, smart guy. Ok, scoured the panoramic, spirit image, and well good and bad. 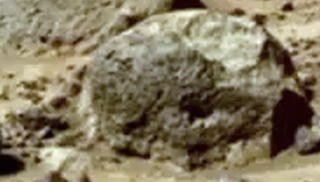 So he emphasized the moss, although the color picker still shows possible licken, moss on this rock, so it isn't discounted only not as bright as he rendered it, (l only brightened, sharpened and put up the contrast a bit). And this one also shows a blue sky, which makes a change from having to remove the red crap. 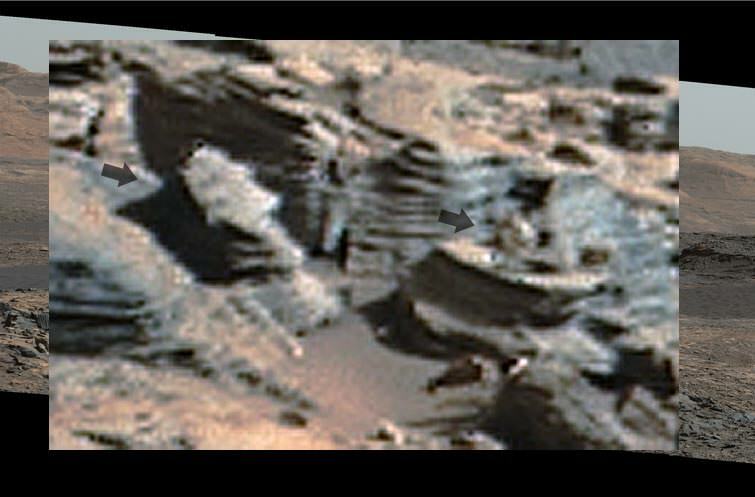 But the reflective rock on the right shows plenty of green stuff behind Curiosity, (color picker shows grey/bright lime green). But that is small pickings considering, what this image really shows. Bottom/one above that, shows a natural pool of water, and yep the thing on the right is a sign. From what l can make out a gray one on top pointing at the water and a human one below that also pointing at the pool, (too hard to make out if reptilian's are covered). And from the children type design on the silver sign, and the shallowness, l would say that it is a kids pool than other. Left arrow show this tall pole, possibly a lookout tower, and some brown things here and there, which is most likely the local inhabitants. Second arrow shows a statue and steps going into the water, the rest l don't know, but pretty obvious that this isn't something ancient. The air pressure being 100 times less than ours is getting funnier by the day. 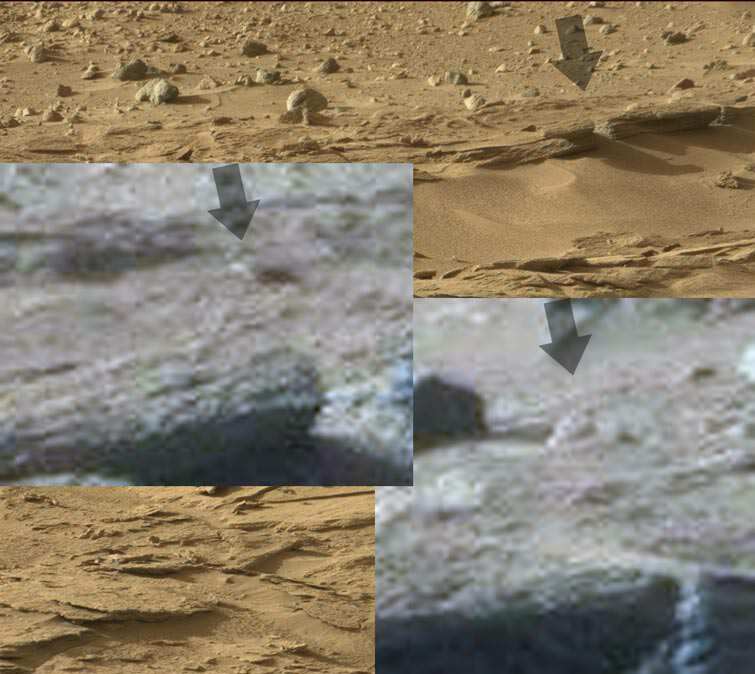 There is also a broken concave type rock on the top, left area, (very reflective) if someone wants to look over the raw image. Lets hope that when Musk lands there next year, it is near this! And the locals say hi, (l would love to see NASA BS their way out of that one). PS this is a good example of why it is better to be informed. I don't see an evil race of gray aliens getting ready to invade Earth, but children enjoying themselves. Someone who is aggressively determined to not believe in this, (l met one of these trolls recently) refuses to believe becuase of raw fear that Hollywood is right. They are not, but it sells. This pool is further up from the kids one, and yep spotted some locals. Not sure about what the one on the far left is doing, but the one on the right, (arrow) is clearly visible. The colored dress also corresponds to the colors used on the sigh, (the human one). 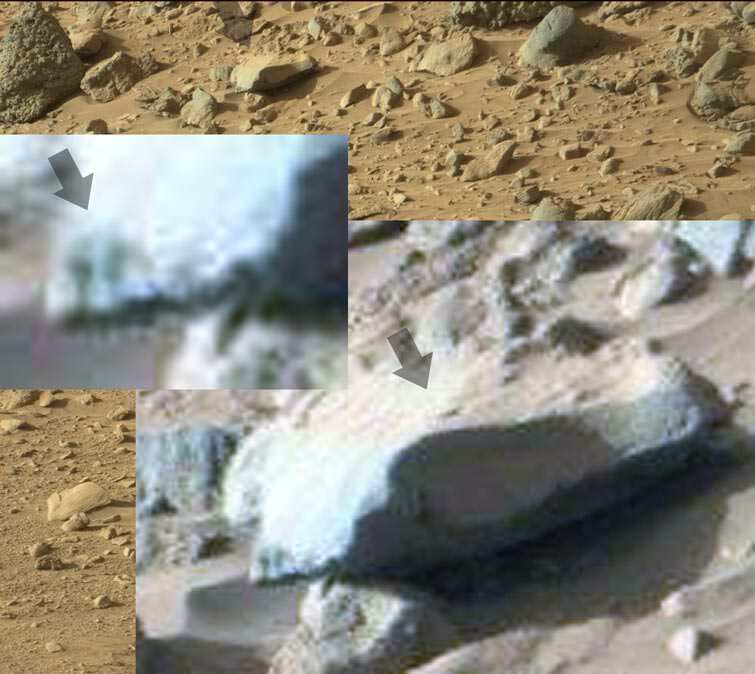 The lower one shows a white water pipe, very hard to tell if the blue, dark blob is a boat or rock with water flowing past it? But the white thing on the left isn't natural. 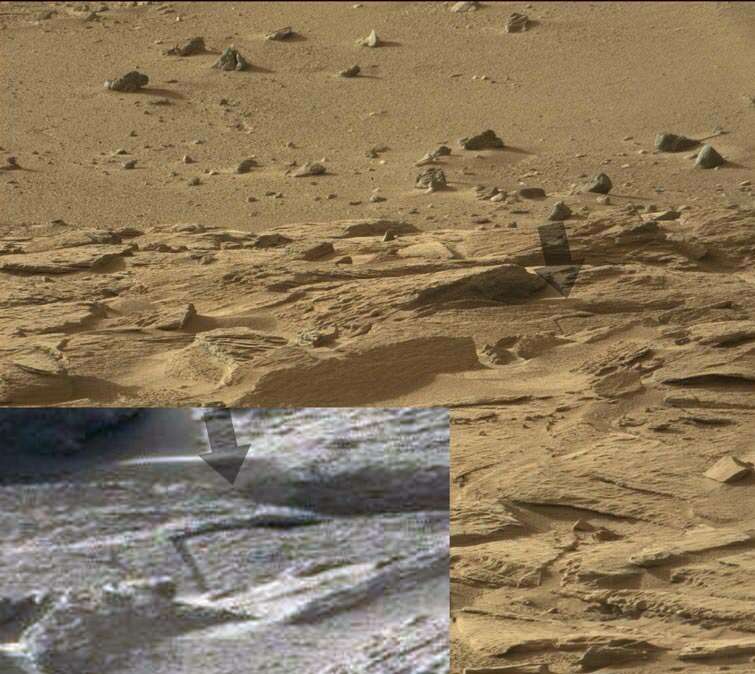 And this, most likely a rusted, steel spear, (Mars still has some relics from the past). This illustration shows Mars through time: Current Mars — red, dead and dry on the left — in contrast with the same landscape covered in water early in the planet's history, more than 3 billion years ago. The Jezero Crater delta, a well-preserved ancient river delta on Mars. Iron-rich rocks near ancient lake sites on Mars could hold vital clues that show life once existed there, research suggests. 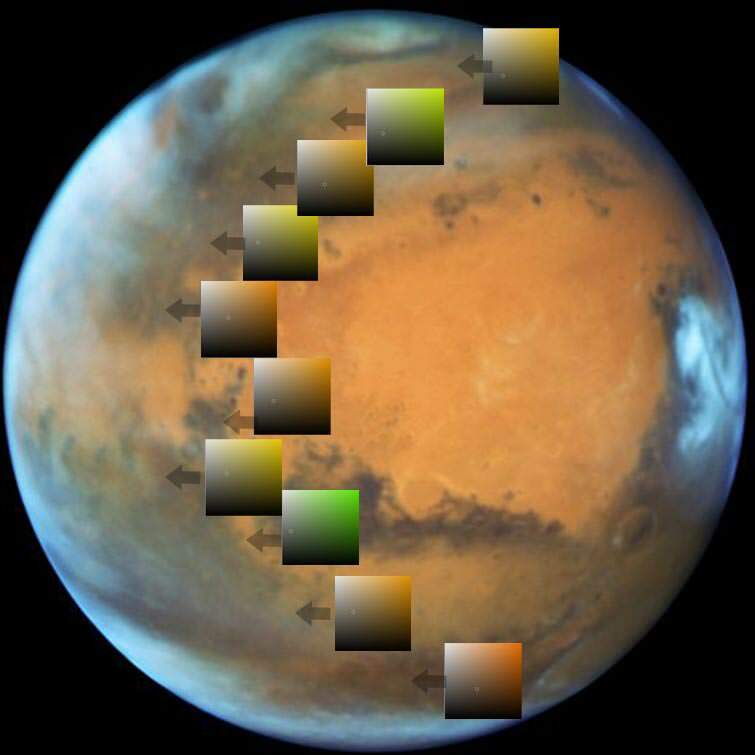 I thought that l should do a color chart for Mars, showing plant distribution across the planet, after all if it is oxidation of iron rocks then the color will be exactly the same, especially if Mars is dead, etc. Shows the equator, (more or less where Curiosity is) to be the driest part, and as we get to the polar regions, it also drops off. But the areas inbetween clearly show different shades of green, or plant life. This image was taken by Hubble. And l took multiple trys with the color picker to find the greenest areas l could find. Curiosity reported to have found traces of methane in the atmosphere surrounding it, but failed to find the source, or more to the truth avoided it. Another scientist also found that Mars was producing methane by using the Earopean satellite, and he ran the test several times with the same result. NASA keep fiddling with visual evidence, but the evidence is piling up that Mars is Earthlike, and our solar system has two habitable worlds. 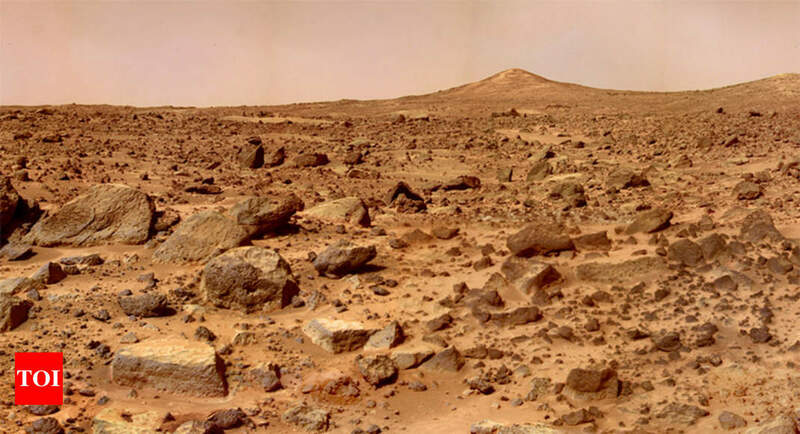 Now if this was a photo of mars that was high def then we could see what I think will be the low areas of mars for where it is the greenest but also why only green as we have Red Maples, oaks and other shrubs here on earth that might also be on mars in terms of color obsorbers. Trees on Earth don't like too much solar radiation. That's why silver birches are silver (because they were among the first trees to advance north after the ice age, and needed a reflective coating as they were exposed out on the plains). Given the lack of protection against all other forms of radiation on Mars, I think it very unlikely anything like a tree could prosper on Mars. But lichen, fungi, creatures able to creep under rocks etc - well why not? All they have to do is to adapt to a v. low pressure atmosphere...but they would have had tens of millions of years to adapt to that. Even more, creatures that live in water would have had no problem continuing to survive on Mars in some form or other. Possible, others have reported satellite images of rivers and forests on Mars. 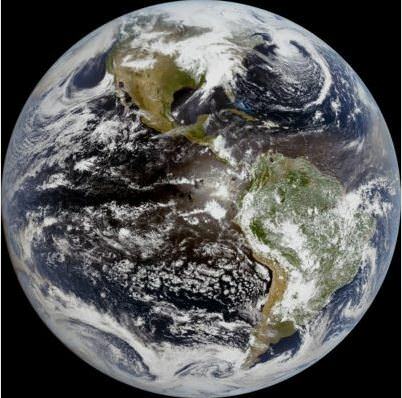 Yep, this is the highest res, we have of Earth. Remarkably similar greens, and atmospheric thickness, although Earth has oceans, and Mars only has some great lakes/oceans up top. But Mars Does have a magnetic field (not uniform like ours, but it does have one). And No, Louis, unlikely that anything could survive in an environment that boils water on its surface. Pretty obvious that Mars has vast amounts of vegetation and an atmosphere similar to ours, so it must have rain, and it must have a breathable atmosphere, etc. As they showed, (hopefully realistically) in Total Recall, pump enough CO2 into Mars atmosphere and the air pressure comes down. Since Mars was similar to Earth half a million years ago, (l know NASA says billion) no reason why some of it survived some global disaster and flourished, (Earth has had a few as well). PS the barely visible green patch on Australia, (where l live) on the right/upper is showing vast rainforests near the ocean, and the great barrier reef, and Mars is showing more green, food for thought. You've basically got the Great Desert of Australia and a bit of the Sahara not under cloud cover in your "representative" pic for Earth. It's called cherry picking. Not very impressive if you have any attachment to the truth. Yes, it is called cherry picking, but l picked the best representative image in relation to Mars, to show the similarities. 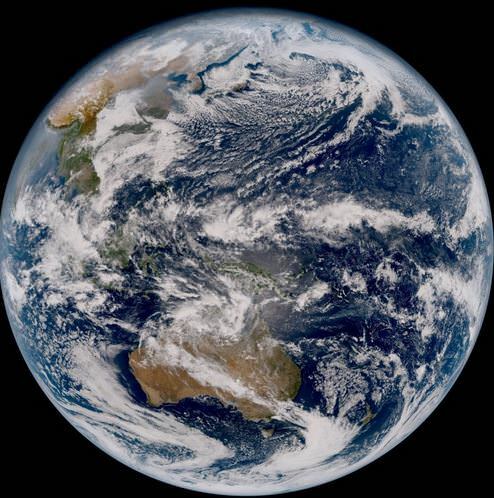 Ok, to be fair here is another, which is about the greenest Earth pic l could find, (and remember that this is true color, not the all landmass are green ones). This shows the similarities with plant life. True that Mars is drier at the equator, but similar to Earth for the rest, (and l picked the greenest parts). 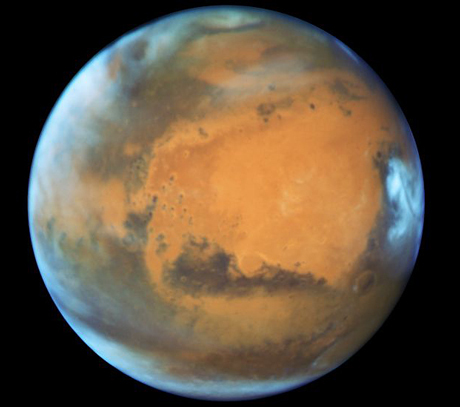 Mars actually has a stronger green than Earth at least for one part, but Earth has more overall. The colors for this area, are Dark green in the middle and moving away as less and less, till nothing. Must be a giant crater with access to a natural underground spring, yep the dark green area, is virtually the same size as Australia's entire forested areas. I bet the European Beagle probe accidentally landed in one of these areas, can't have images of a forest or rainforest on a dead planet. Other green areas follow this pattern of rich forest in the middle and drying out the further away you go, as SpaceNut has said, it is probably the lowest or giant cratered areas that are the greenest. 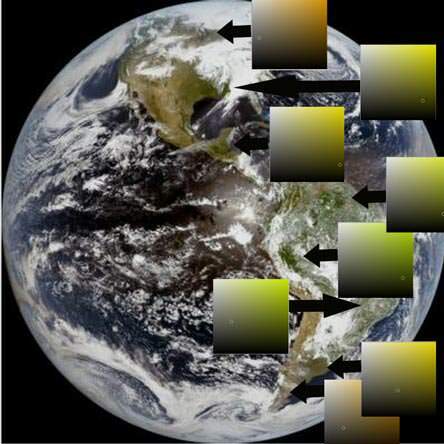 Shows the similarities with Mars atmosphere and Earths. 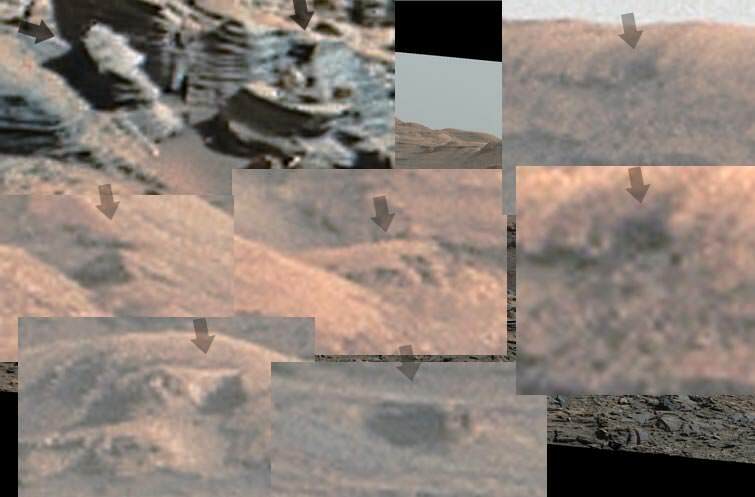 Lower images show all of the dwellings, typically buried in the mountains. What appears to be a humaniod fugire with a top hat, singing l think, (couldn't make out the lettering around it, but l wouldn't be surprised if it read, "Eat at Joes". 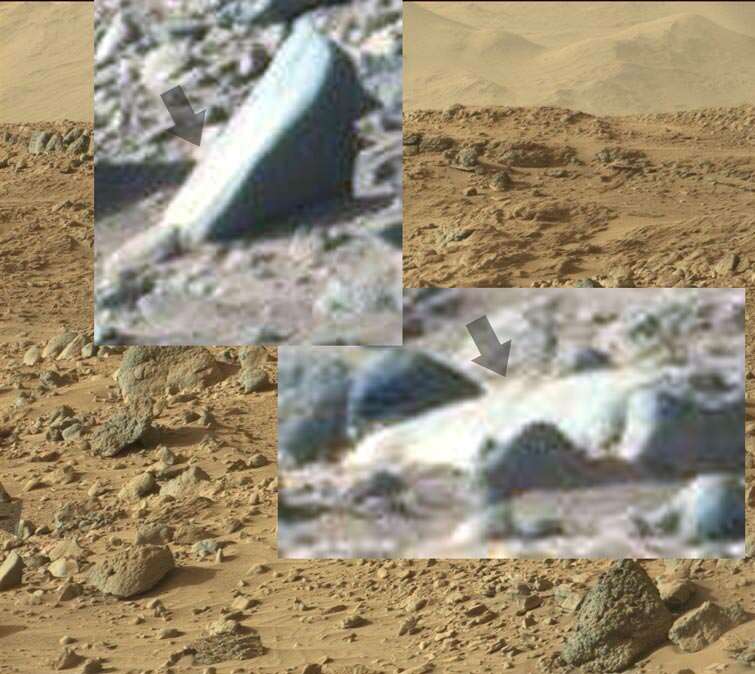 Top image is this white thing on the rock, beats me what this is, creature, machine? But the thing on the right is a machine. 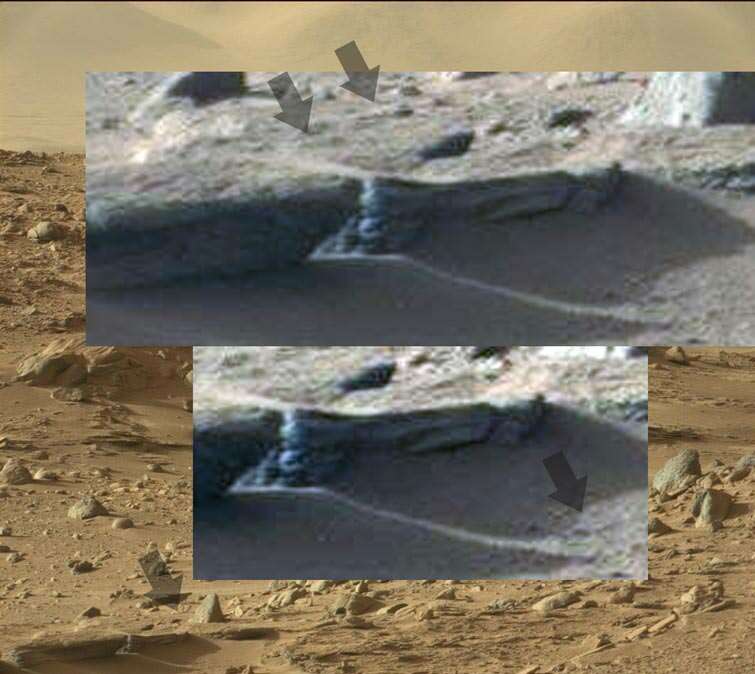 Maybe this is Curiosity's reflection, but it seems more likely that a silver sphere is sitting on this table, and is depicting something, or just reflecting something back. Either way nothing l have seen so far shows an evil race. More likely we are the ones that need to shape up, or NASA does. The image above with that ominous peak (Mt.Sharpe?) in the background is too red obviously. 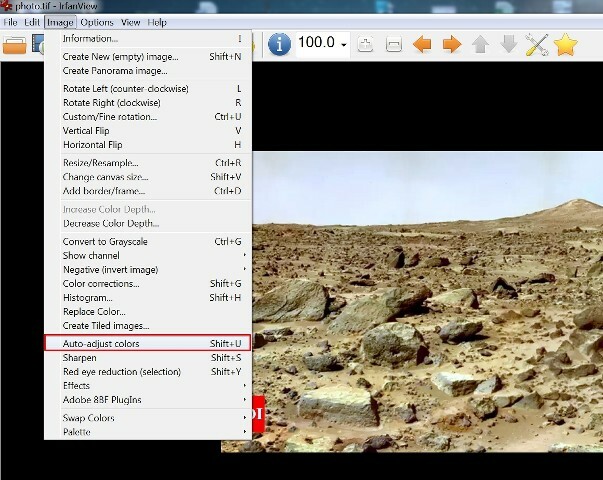 There's quite a few really good imaging programs out there, I personally prefer Irfanview for its "Auto Color Correction" algorithm and seems right on the money on my monitor. The higher magnifications on the bottom left corner reveals clearly some very facinating shades of green and even grey. FMP, those rocks have something green embedded on the surface. Green is what? Mold comes in many colors, including black, white, gray, green, red and blue. The color of mold growth is not only influenced by the genus of the mold, but also by the conditions in which the mold formed, the nutrient source the mold feeds from and its age. There is as a black mold as well. Like most fungi, molds grow best in damp conditions and if spores find a moist surface to land on, they grow. Yes, nice, and probably a combination of moss and lichen. And a good software option other than Photoshop, for at least showing true colors. The rubbing your eye one, is l believe a reflective rock, (Curiosity in the foreground and the mountains in the background). The white thing l saw before clinging onto a rock is a believe a plant, or relying on the opening, is a Venus Flytrap type plant, that catches insects and possibly even spiders, (Curiosity ran over one, video post #1) and maybe even rodents, (spotted plenty of those) by using some sweet liquid, etc to entice their pray into their mouth to get stuck. 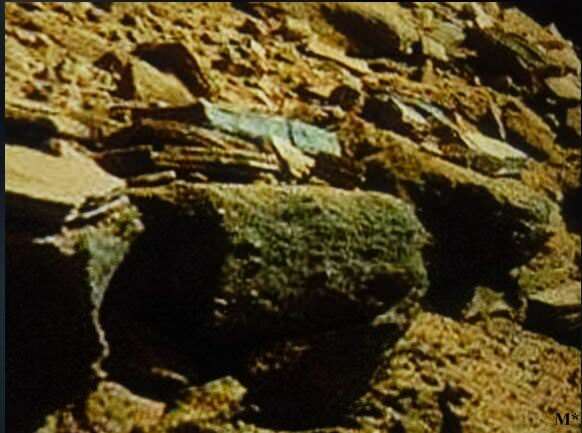 Obviously some speculation on my part, but it isn't a machine and is clinging onto the rock like a plant, with possibly some substance coming out of it, so l am probably in the ballpark. Biologists are going to have kittens when NASA announces all of this. The last image you posted gives me a laugh since someone recently tried to pick a fight with me by posting that same image elsewhere. 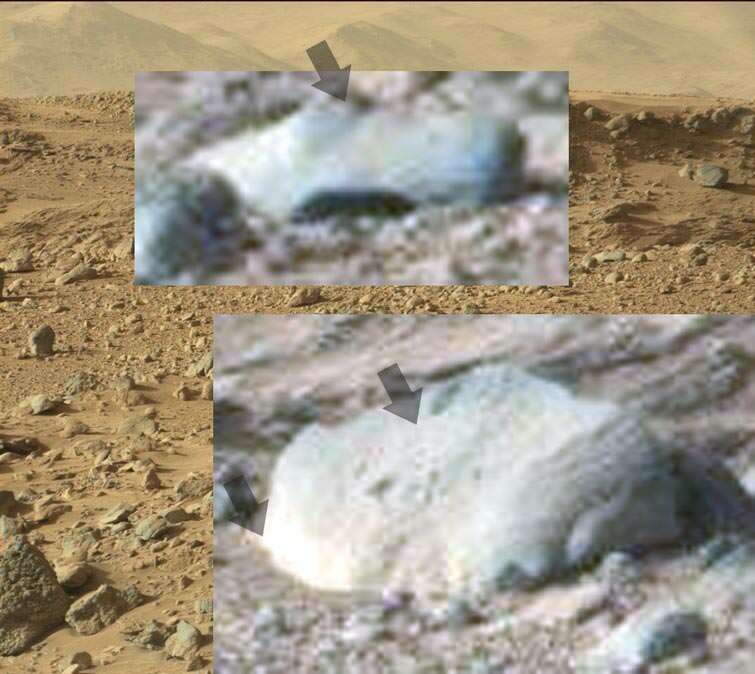 He posted the false or red one, and jockingly said, "see mars has life". 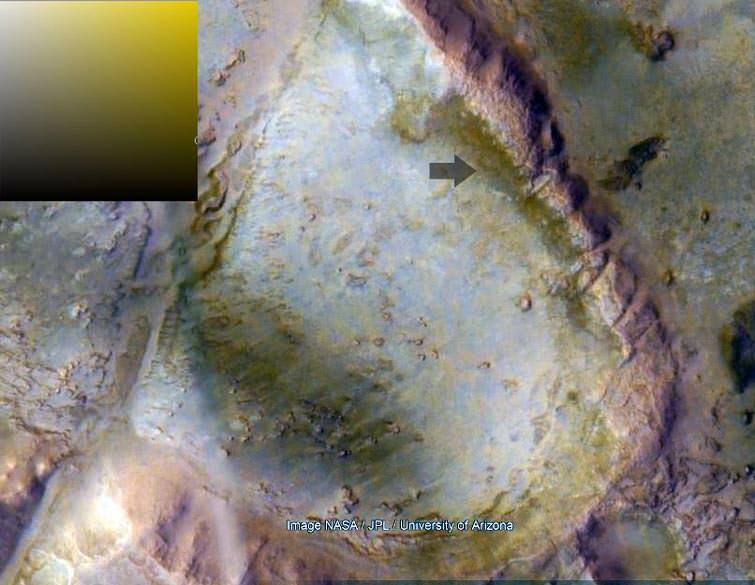 All l could do is laugh, he, (and others) have no idea what is really on Mars, glad we do. Obviously colorized from b/w, but the huge areas of green, have to be something more than licken. Another guy, not surprisingly found lakes near some of this, even b/w images clearly show that. I had to color correct it again to get the true colors. I don't think that this is a lake, but it has plenty of plant life. And interesting to note that from orbital images of the entire planet it is usually green/gray, but in closer ones it is more pure green, (the circle in the color picker image shows the actual color). Plant life on Mars, should open a few doors.